Iceland is one of the most beautiful scenic Countries I have been to, from Mountains, rivers, lakes, hills, valleys, waterfalls, fjords, natural hot springs, ocean to beautiful beaches, its amazing. I visited Iceland in March 2016, March is still very cold, the reason for going in March is to see the Northern lights, after April 15 the chances of seeing the northern lights are slim due to longer daylight hours. Southern Iceland tour, they were both worth it. Also did the Northern lights night tour. Listen up... Iceland, Norway and Switzerland are the 3 most expensive countries I have been to. There are low cost airlines offering cheap fares to Iceland, at the most you;ll get a water to drink on these flights, even a small earphone to listen to music or watch something is going to cost you, bring your own. In Reykjavik a small coffee, I am talking small as in a third the size of a medium coffee at a Starbucks in America, the cost in Iceland is US$ 4, a bowl of soup at a very average place can cost US$ 20, Credit cards are accepted everywhere, Credit cards make you over spend. The reason for all this is so that you budget and plan your trip and enjoy it making the best of it. Don;t fall for the low cost air ticket or free stopover. Airport is 40 kilometers outside Reykjavik, cab to your hotel will be over $100 US, take a Bus to Reykjavik and the fare is about $20 one way. Arrivals - Quick and easy, if you drink alcohol, stop at the duty free on your way out, prices are much cheaper then a alcohol shop in Reykjavik. 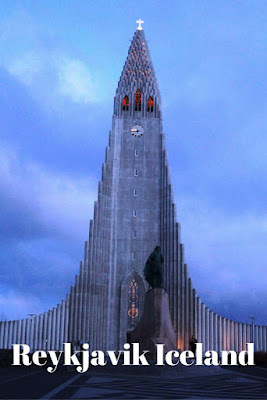 I stayed at a very average, expensive hotel in the heart of the town, near the city center, close to Eating places, visitors center, the harbor and walking distance to the Harpa a concert hall and conference center, also walking distance to Hallgrimskirkja the tall Church in Reykjavik. Great pickup and drop off location for most day tours. Hallgrimskirkja the tall Church, great views from the top,see picture below, its about a $12 dollar for the elevator ticket. The Church Building is impressive, the interior is nothing to write home about. I was more interested in the Leif Erikson statue on the horse outside the Church, having lived in Minnesota I had heard that Leif Erikson was the first European to come to America and not Columbus. Amazing, no other words to describe it. I booked a tour in Reykjavik, the tour bus picked me up at 10 PM in the night and drop off was 2 AM. The tour will only operate on a clear night, and that to you are not guaranteed you'll see the northern lights. If you are going to photograph the lights, my suggestion is to use a tripod, since I didn't have a tripod I couldn't get a 30 second exposure that I would have liked to have. Anyways it was a clear night and I got to see the lights. A must Do/See, dress warm. It tells the story of Iceland, history and has artifacts, my opinion don't go out of your way to see it, I spent an hour there. Pictures I took while at the Museum. Blue Lagoon - I didnt do the Blue lagoon, its on the way to the airport, you can stop during or on your way back to the airport, best to check with Visitors center in Reykjavik. Anyways I saw the Horses, petted them, and they are beautiful, and friendly. There are 80,000 Horses in Iceland. Street Art in Reykjavik - Quiet a bit and some places its very well done. If I visit Iceland again - I plan to rent a car from the airport and drive the Ring Road, Camp and cook out, the best way to see Iceland. What a great blog post and all the informations! I am planning a visit to Iceland soon - it helped me a lot for the calculation of my budget! So cool that you got to see the Northern Lights, I've heard it depends a lot on luck. Iceland is expensive, that's also something I've heard a lot. I've been to Switzerland and Norway and I remember finding Norway extremely pricey, so I imagine Iceland is somewhat similar. Thanks for the tip on using an tripod to photograph the lights. I'd love to go to Iceland, but it's good to know that things there are so pricey. Thanks for sharing... I'll have to save up! I went to Iceland myself earlier this year and I loved it too! As well as all the places you listed above, I really enjoyed the waterfalls, Golden Circle, glacier hikes and geothermal spas that are on offer. Such a fantastic country, and worth the hefty price tag! OMG! I agree with you that Iceland is expensive. Flights to there from US or Canada is cheap but local expenses there is what will get ya! I would say the top three most expensive countries I've been to are Iceland, Switzerland, and Japan. Having said that though, there are ways to save money. Someday .. when I get rich :D Amazing that you got to see the northern lights, once in a lifetime experience!